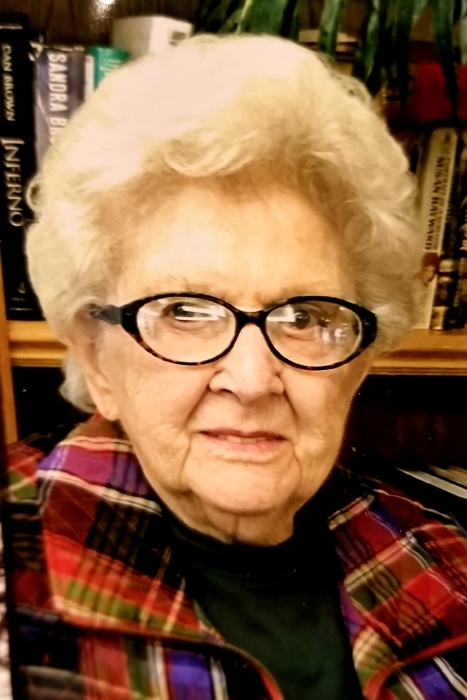 Ina Rose “Posie” Krueger, age 91 of Clintonville, passed away on Sunday, March 24, 2019, at ThedaCare Medical Center, Shawano. Ina Rose “Posie” Krueger was born on March 11, 1928 in the Township of Matteson, Waupaca County, daughter to the late George & Ella (Moder) Olson. She attended a small country school, and later studied in Clintonville, graduating from CHS in 1946. Posie was employed at the F.W.D. Corp. doing secretarial and bookkeeping work. She was united in marriage to Harland A. Krueger on May 1, 1948 in the Town of Matteson. The couple moved to Lunds, WI and started farming; they also farmed in Bear Creek, and later in Belmont, WI. During their years on the farm, Posie always did the bookkeeping and paperwork in addition to her other responsibilities. They retired from the farm in 1979, and moved to Salida, CO, where they built an A-frame home in the mountains. Winters were spent down South near McAllen, TX. In 1994, they relocated back to Marion. Harland passed away on October 15, 2006; Posie later moved to Aster in Clintonville in 2016, where she has lived since. She was a member of Christus Lutheran Church, Clintonville, where she was active on the Ladies Aid. In her early retirement years, Posie loved to golf; she also was a quilter, played card games like Sheephead & Schmier, as well as Dominoes, and other board games. She was an excellent cook and made many of her popular dishes without a recipe, including her tater-tot-casserole; a family favorite. She always had a good book nearby, usually a western. In her later years, she also enjoyed being a part of the Red Hat Society. Posie will be remembered as an outgoing, at times, outspoken, but above all, loving mother, grandmother, & great-grandmother. Family was very important to her and she cherished the time spent with her loved ones. Posie was preceded in death by her parents; her husband, Harland; infant daughters, Christine & Mary Lou; an infant son, Terry; a sister, Velma Laux; brothers, Floyd “Mike” Olson, Dale “Ike” Olson, Robert “Bob” Olson, & Kenneth “Ken” Olson; and a son-in-law, Daniel Bettin. Funeral services will be held 10 AM, Thursday, March 28, 2019 at the Eberhardt-Stevenson Funeral Home & Crematory, Clintonville, with the Rev. Brian Crocker officiating. Inurnment will take place at Graceland Cemetery, Clintonville, at a later date. Friends may call from 6 – 8 PM on Wednesday, March 27, 2019, and again on Thursday from 9 AM until the time of the service, all at the funeral home. The family wishes to thank ThedaCare At Home Hospice, as well as the staff at ThedaCare Medical Center, Shawano, for all of the loving care given to Posie during her stay.